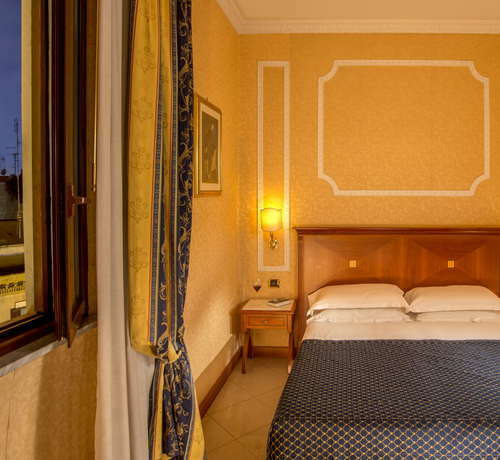 Convenient to St. Peter's, the Vatican, and Prati's Cola di Rienzo shopping district (and just a block from the Ottaviano stop of Metro line A), this small, family-run hotel is crisp and smart. Spacious, clean rooms are simply furnished, freshly painted, and accented with patterned bedspreads and tile floor. Having the Metro nearby is convenient for getting to the centro storico. 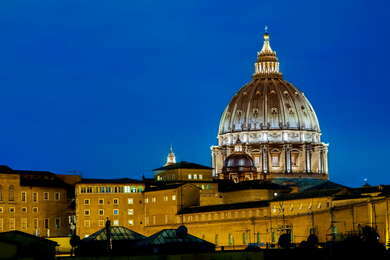 Ask for a room with the view of St. Peter's cupola. Rooms are simple and clean, with plenty of floor and closet space. The gold decor of the curtains and walls pays tribute to the flag of nearby Vatican City. Giant oak beds and wide desks provide a spacious setting. Mattresses and pillows could use a refresh and are better for those who like a firm sleeping surface. Each room has a flat-screen TV and refrigerator. Bathrooms also tend to be on the spacious side, with cool tiled floors. The only amenity is a soap dispenser, so bring whatever you may need. Towels are quite thin for Italian standards. The friendly reception is open 24 hours. There's a refrigerator behind the desk full of sodas and water if you want to fill up your mini-bar. You will access your room via a caged elevator or marble stairs. The restaurant is only open for breakfast, offering simple juices, pastries, deli meats and cheese. While nothing fancy, it's a good place to get the essentials before starting out on a long day. You'll be set for any sightseeing you want to do at Vatican City, getting to the centro historico is just a short bus or car ride away. The Ottaviano metro stop is just a two-minute walk from the hotel which will also take you directly to the center of Rome. La Soffitta Renovatio (4-minute walk away) is paradise for celiacs. It's home to one of the best gluten-free pizzas in the city, as well as offering a full menu of glutinous foods for normal diets. Be sure to book in advance, as they often seat large tour groups. Or if you're in the mood to carb load, head to Bacio di Puglia (5-minute walk) to load up on focaccia, panzerotti (a small calzone) or ravioli. It's one of the few decent budget food options surrounding the Vatican. Right beneath the hotel is Rome's famous Castroni, a market full of delicacies from around Italy and beyond. The bar is the perfect place to grab a coffee, sandwich, or quick cocktail. And you'll definitely want to stop here and load up on packaged coffee, chocolates, pasta and more before you leave Rome. The Basement (6-minute walk) is a friendly pub that caters to tourists, but thankfully without the tourist prices. This is a great budget option if you would like to stay close to the Holy See and be the first one to arrive at the Vatican Musesums in the morning. Furnishings are modest, but they're clean and comfortable. While overall the hotel amenities could use an upgrade, the friendly on-call staff will work around the clock to fix any issues you might have.